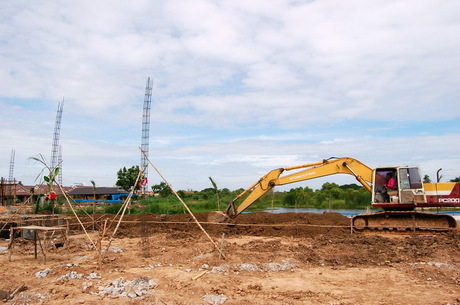 When setting the first foundation of a Thai house, it is a common practice to hire a Brahman priest and hold a blessing ceremony. Enter Ajarn Chachawan (Ajarn is an honorific title equivalent to sensei in Japanese and pretty much nothing in English), pictured on the left in the photo below. He was also the announcer/master of ceremonies who did the morning ceremony for our wedding two years ago. He will also be supervising the installation of an animistic “spirit house” on our property this month or next. Truth be told, he’s pretty much our go-to guy for all our Brahman needs. 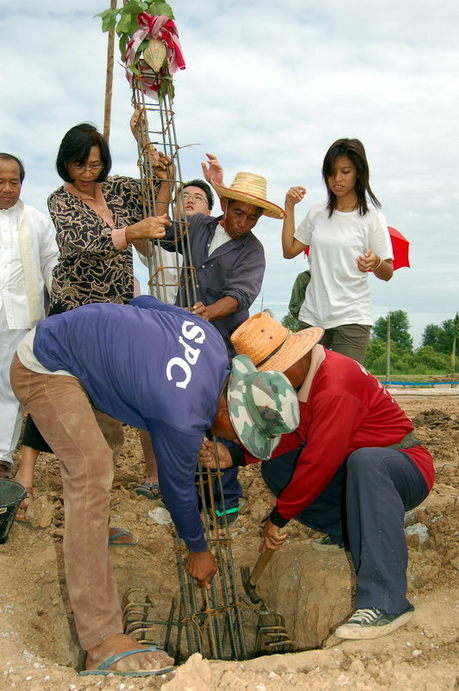 Clockwise from Ajarn Chachawan: Mother-in-law, yours truly, worker, Nam, worker in red shirt, worker in OSHA-approved safety flip flops (standard worker footwear here; they even weld and walk on roof support beams in them). The shot below was taken from the rear of our property (marked with wooden border) toward the pond and front of the (then future) house. You can see the two foundations we just planted held in place with tripodal wooden supports. 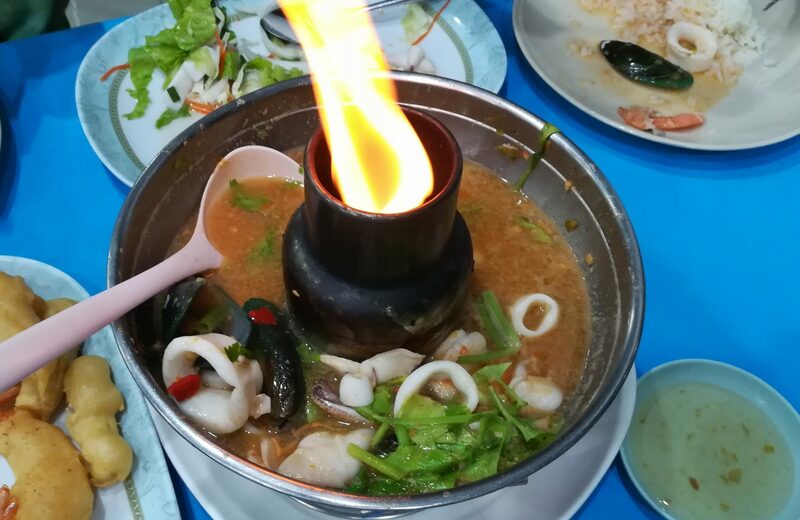 Tied to those foundations with holy-ish string are items of various significance such as banana tree branches and a woven reed fish trap with coins (Thai Baht) in it (we were warned not to put a lot of money in the trap since it would be stolen in the night. And of course it was.). In the holes for the foundations, under the two-piece (tower in basket) wrought iron assembly, we also placed items of various significance which we purchased/gathered a day earlier. This included a specific kind of unhusked “new” rice (that I popped over the stove like popcorn), leaves of a religiously significant species of tree (from a nice old lady’s yard – she also gave us seeds to plant our own trees with, but we lost them), special gold/silver/bronze painted bricks and cedarlike stakes that we purchased at a Buddhist goods store, plus a few other things that escape my memory (at one point I had the list we used for shopping but I lost this as well).